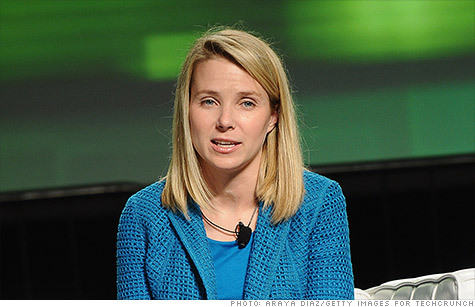 Yahoo is paying lavishly for Marissa Mayer, its fourth CEO in as many years. NEW YORK (CNNMoney) -- Yahoo coughed up a lot of cash to land its hotshot new CEO. Marissa Mayer's compensation package could be worth an eye-popping $71 million over the next five years, according to regulatory documents Yahoo filed on Thursday -- and it would top $120 million if an extra batch of stock grants that she is eligible for comes through. Mayer's pay package is by far the most lavish that the company has offered to its recent string of CEOs. On top of a $1 million annual salary and $2 million target bonus, the deal includes a rich combination of stock grants and options. Mayer is getting a stock grant valued at $14 million to compensate her for the Google pay she left behind when she resigned from her previous employer on Monday. Those shares will vest in stages through 2014. Yahoo also gave Mayer a one-time $30 million "retention award" that will vest gradually over the next five years. Half of the award will be a straight stock grant; the other half will be stock options with performance-based vesting criteria. Mayer also netted an equity award worth an additional $12 million in stock and options. That award will vest over the next three years. Adding all of those equity awards together, plus the $15 million in salary and bonus that she stands to collect over the next five years, puts Mayer's total package at roughly $71 million -- although its actual value will depend heavily on how Yahoo's stock fares and whether Mayer hits her performance goals. Her real payout could be significant higher. Mayer will be eligible for additional equity grants each year, which Yahoo envisions will be "not less than" the $12 million she stands to collect for 2012. The size of those annual grants will be subject to the board's evaluation of Mayer's performance and "current market compensatory levels and practices." Yahoo has a history of being generous to its long string of incoming CEOs. Scott Thompson, who lasted a mere four months, got a $1 million annual salary and incentives that could have pushed the value of his first-year pay package as high as $26 million. Instead, Thompson left with no severance after a scandal over his embellished educational credentials. He was able to keep around $7 million in cash and stock grants that Yahoo (YHOO, Fortune 500) had already made. Yahoo also paid out $3 million last year in severance to Carol Bartz, the CEO whom Yahoo's board fired in September. Bartz's deal included accelerated vesting on stock grants and options that are worth millions more. Mayer already made a fortune from her time at Google (GOOG, Fortune 500). As one of the search giant's first employees, she scored big when the company went public and has a net worth that is frequently estimated to be in the $300 million range. She bought a few splashy toys with that money, including a $5 million penthouse atop San Francisco's Four Seasons hotel with a custom Dale Chihuly glass installation covering the ceiling.